ILL-LOGIC is a stand alone compact system with semi-modular structure. 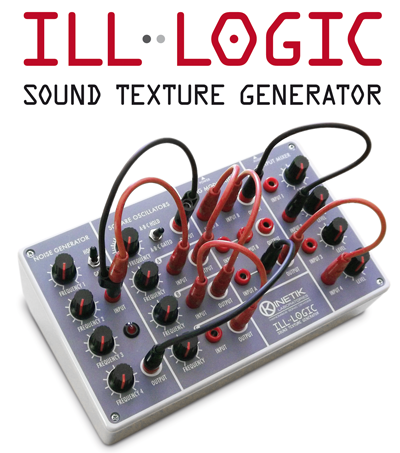 It can be used to generate complex sound textures. Using 4mm banana plugs it offers great functional flexibility and small footprint. It has 12 knobs, 22 connection points, two switches and a red led that reflects the behavior of the noise generator. The input plugs accept any output allowing you to experience the most of its sonic potential. It must be supplied with an external power supply, providing 9vDC on 2.1mm barrel jack, negative tip. ILL-LOGIC comes with a set of 8 banana patch cords.